Coral reefs in Guam. Courtesy Kiho Kim. Coral reefs sustain marine life all over the world and protect its vulnerable coastlines. But the reefs are increasingly endangered, mainly because of pollution and rising ocean temperatures. Scientists, including American University's Kiho Kim, are racing the clock to assess the true extent of the damage before it becomes irreversible. Today, new technologies are making it possible to see inside coral, to examine the skeleton cores for devastation caused by humans. Kim and his team members used a novel chemical technique to study coral skeletons to document the impacts from human activity. A new study published in Marine Pollution Bulletin explains how they did it in the U.S. territory of Guam, a small island nation undergoing dramatic ecological change. This is especially critical for Guam, where the island's population, currently 160,000, is set to grow by an estimated 40,000. This influx will occur when U.S. marines and their support services relocate from Japan. Though the marines have not yet moved, the U.S. government is working on plans, according to recent news reports. Coral reefs are under stress like never before. Many reefs are taking longer to recover from bleaching events, which occur when warm waters or pollution undermine the coral's ability to feed. Coral turns white and becomes more susceptible to disease. Recently, scientists discovered whole sections of Australia's Great Barrier Reef dead due to warm water temperatures. "How we manage and treat our sewage affects how much pollution ultimately ends up on our coral reefs. 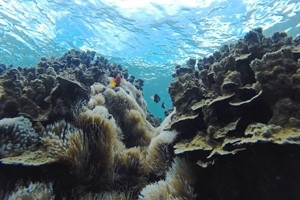 In general, reefs are resilient and can come back if the stressor is removed," Kim said. "The challenge is the high cost of upgrading sewage treatment plants. But we have to weigh the costs of upgrading treatment plants against the costs of losing the reefs and all that they provide, such as food, tourism and protection against storm damage. With the proper accounting, the math generally favors paying to protect coral reefs and other coastal ecosystems."